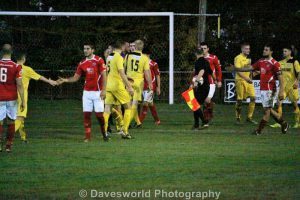 Newport IW FC crashed out of the Buildbase FA Vase following a 1:0 defeat to Buckland Athletic FC. Newport looked under pressure for the majority of the half struggling to breakdown Buckland and create chances to test their goal keeper. 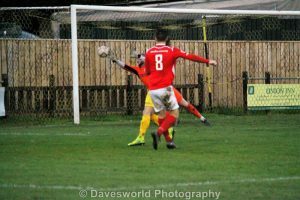 Buckland were confident with playing the ball around the park and getting in behind Newport’s defence although Gary Streeter was yet again on form stopping anything that was put to him. 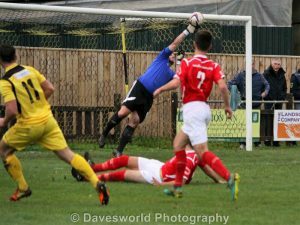 Gary Streeter made a spectacular save on 40mins when Buckland striker broke in behind Liam Newbold on the left then cutting onto his right releasing a shot which was heading for the top left hand corner of the goal. Streeter leapt to his left tip the ball over the crossbar, this was by far save of the match. Both teams knew that the last 45 mins of the game would be crucial which looked a game that only one goal would secure a place in the next round. It was 3 minutes into the second half when Buckland Athletic FC struck. Liam Newbold gave an easy ball away to Buckland which saw them drive to the edge of the 18 yard box and hitting a screamer of a shot towards Gary Streeter. The ball smashed against the crossbar, Gary Streeter turned around to see where the ball had gone when it came back off the bar and hit him in the face deflecting back into the goal putting Buckland 1 nil up. Newport then pushed on making changes to play a back 3 and utilise an attacking setup. Liam Triggs had the best chance for Newport with some slick football from Keelan Walsh, Connor Kelly down the left. This gave Liam Triggs space turning Buckland’s defender inside out as Triggs pulled the ball onto his left and firing a shot on goal which was tipped away by Buckland’s keeper. Newport then had another chance cleared off the line and unable to pull back that unfortunate early goal at the start of the half. An outstanding performance from Keelan Walsh playing left back saw Newport dominate possession at times during the half with confidence from such a young player. 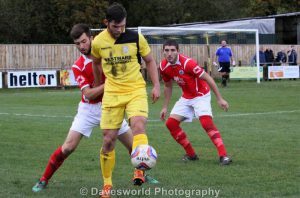 Newport were unable to get a goal against a good and confident Buckland setup with the game ending Buckland Athletic FC 1 Newport IW FC 0 and a place in the 3rd round of the Buildbase FA Vase. Man of the match went to Gary Streeter for his outstanding performance……..well done Gary.